Mayor Joe Anderson played a major part in the One North Report launch event in Manchester sharing the platform with Chancellor George Osborne and presenting Liverpool’s case to be part of a ‘Northern Powerhouse’ and bringing a HS2/3 link to Liverpool. The One North report has been developed by an alliance of five cities – Liverpool, Manchester, Leeds, Sheffield and Newcastle and following the launch has the backing of Chancellor George Osborne. The Chancellor added that the combined strength of the north’s major cities was “greater than the sum of its parts” and assured there would definitely be money available from government to help them realise their ambitions to become an economic zone that could rival London and other world cities. East to West cross rail link connecting the cities of Liverpool, Manchester, Leeds, Sheffield and Newcastle. Following the launch of the report there is certainly a unity among the 5 Northern Cities as well as support from Government but in Liverpool’s case we need to priortise and cement the elements highlighted above and in the report meaning the continuation of arguing the business case for Liverpool – ensuring we as a city are the start of HS3 and any East to West cross rail link. City leaders and transport chiefs welcomed the support of Chancellor Osborne for their 30 year strategy that will potentially bring billions into cities such as Liverpool and Manchester. The Chancellor, George Osborne, recently spelled out the case for a `Northern Powerhouse’ to compete internationally in the way that London does. In terms of rebalancing the UK economy towards the North, it makes sense for the great cities of the North – particularly Liverpool, Manchester and Leeds – to combine their formidable assets and enable them to punch their weight in an increasingly globalised market. The right conditions need to be created to convince people to stay, work and live, and keep their talent in the region. It is essential, therefore, that these cities are better connected. This means ensuring that Liverpool is on the proposed HS2 line from London, and the starting point for a future West/East HS3. Liverpool and Manchester epitomise the synergies that exist in the North West – they have complementary strengths, so literally the sum is greater than the parts. Liverpool and Manchester’s links go back to 1830 and the creation of world’s first intercity railway. Today, over 2 million passengers every year commute between these two cities, despite an average time of over an hour for a journey of just 31 miles. The goal should be for a fast, frequent service taking 20 minutes or less. The Chancellor frequently referenced Liverpool in his `Northern Powerhouse’ speech and the reasons are self-evident. High quality graduates from our universities, an internationally recognised life sciences cluster and a port which is being readied to handle the next generation of container carriers, are just some of our assets. Better, faster connections across the North will allow us all to work better together and thus compete more effectively in global markets. It is with great sadness and deep regret that we announce the death of Sir Peter Hall. Peter was not only a supporter and contributor to the 20 Miles More campaign but was also a friend. A geographer and town planner by trade Peter’s main concern was the growth and change of cities. He was Britain’s leading expert in the field, a world renowned professor of planning and regeneration at the Bartlett University College London and president of the Town and Country Planning Association. His contribution, knowledge, vigour and charm will be missed by all. The UK’s economy is highly unbalanced; we have the worst regional disparities in the developed world and London’s property prices are also the world’s most expensive – second only to Monaco. Rebalancing the economy is crucial to our future, and it can be done. With the right investment in transport infrastructure, a second megacity formed by linking Liverpool, Manchester and Leeds, is achievable and could rebalance the UK economy by shifting focus from the dominating south-east. This could be achieved by creating an economic powerhouse in the north, one that replicates the very factors that underpin London’s growth: a large and diverse population and economic base, the ability to attract and retain talent, a critical mass of smart professionals and super-creatives, excellent science institutions, universities and schools, vibrant arts and culture and a first class regional, national and international transport. It’s a tall order. Even the best of the Britain’s second-tier cities would struggle to deliver all this. None of them is big enough – and we know that in modern economies size does matter. Geoffrey West, a physicist at the Santa Fe Institute, has analysed the mathematics of cities and says that there is a rule that holds firm in cities across the world. According to West, each doubling in size of a city brings with it a 15-20% increase in wages, number of patents filed, the number of highly creative people employed, and an increase in efficiency of transport systems, among others. At the same time there is a matching increase in crime and pollution – but the benefits of higher wages and greater opportunities outweigh these disadvantages. CAN TRANSPORT DRIVE THE NORTH FORWARD? London reflects this urban mathematics. Outside the Greater London region there is perhaps only one place in the UK where these economies of scale could be replicated: in the heavily urbanised east-west belt that stretches from Liverpool, through Manchester and over the Pennines to Leeds. These three city regions have scale, dignity and presence. They also have a massive asset in Manchester International Airport. Their universities are among the country’s leading research institutions and decent housing is affordable – especially for the young professional families now being priced out of London’s housing market or forced to accept crippling commuting and mortgage costs. 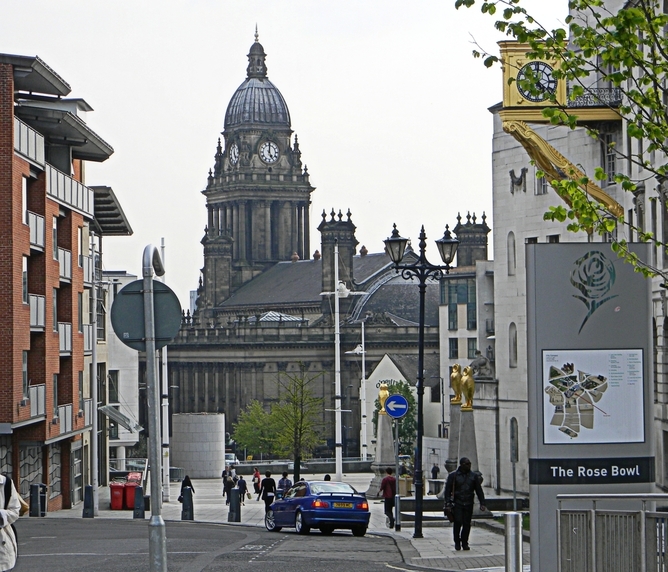 Higher speed rail connections between Liverpool, Manchester, Leeds (and perhaps Sheffield) could reduce the Liverpool-Leeds journey time to only 50 minutes, bringing together the cities’ labour markets, generating critical mass and driving the creation of agglomeration economies from bringing the cities closer together. David Higgins, chairman of HS2, drew attention to this issue in a recent speech – as did chancellor of the exchequer George Osborne this week. Peter Hall, David Thrower and I set out detailed proposals for “High Speed North” in April 2014, building on the extremely modest Northern Hub investment and electrification between Liverpool and Leeds which is already committed or in progress. These began with the introduction of the Pendolino “tilting trains”, required to cope with the steep gradients and sharp curves on the trans-Pennine route. It also included a reintroduction of four-tracking – a railway dual carriageway, with two tracks travelling in each direction – to provide greater capacity and allow fast trains to overtake slower services. The proposals also called for local trains in Manchester to be rerouted onto new sections of the Metrolink tram system. For later stages of the project, we proposed a new 20-mile route from Warrington to Liverpool, which would become part of the High Speed North network and a vital high speed connection from HS2 to the centre of Liverpool, increasing capacity on an increasingly busy passenger and freight route. And finally, a new 13-mile “base tunnel” under the Pennines from Manchester to Huddersfield – startling as it may sound, new rail tunnels are not uncommon in other countries such as Germany. The evidence we have seen on comparable tunnels suggests a range of construction costs between £1.5 and £4 billion. London’s Crossrail, which is of similar length, has cost £16 billion. The chancellor’s Manchester speech this week did bear an uncanny resemblance to our earlier ideas. Was it plagiarism, thought leadership or just a bizarre coincidence? We don’t know and we don’t mind. For once, the government is running with a big, imaginative and relatively inexpensive idea. To be sure other things need to happen in these northern cities. But the Chancellor’s proposal should be explored further, not dismissed as another bright idea that will end up in a cupboard after the next general election. Ian Wray is a Trustee of the Town and Country Planning Association, a member of the Royal Town PIanning Institute General Assembly, and a Visiting Professor and Visiting Fellow at Liverpool University. The Mayor tabled a motion at a meeting of the full council held at the Town Hall. Councillors then carried the motion in support of calls for HS2 to be extended to Liverpool. It noted an announcement by the Chancellor of the Exchequer “to start a conversation” about the east-west High Speed 3 (HS3) route and welcomed that this will be fed into a review of the second stage of HS2. The motion outlined that the council also welcomed the establishment of the business–led 20 Miles More campaign to secure Liverpool’s inclusion on the network. It noted the council welcomed the campaign for the first stage of HS3 to start from Liverpool and believed the Chancellor’s announcement strengthened the compelling argument for a direct HS2 connection to Liverpool. The authority reiterated its support for a direct HS2 connection to Liverpool and for an East-West HS3 route from Liverpool. The Mayor also said that Liverpool “won’t be left behind” and he added: “We need to get the east-west connection.